My great friend Tom Miller writes the blog Daytonian in Manhattan. Tom isn't an architect but he knows more about architectural history than anyone I've ever met. Tom's a 30-year resident of Manhattan and he's a consummate New Yorker. Every corner of that town has had something notable happen on it and I swear Tom knows every one of those stories. Last winter, he started a blog about Manhattan architectural history and five days he week he publishes a new story of a building. On the 3rd of September he wrote a post called The House the Circus Built --10 St. Nicholas Place. And in his post he told a story of James Bailey. Bailey was the Bailey of Barnum and Bailey. Baily's home from 1880 is still standing and in a remarkable state of preservation. 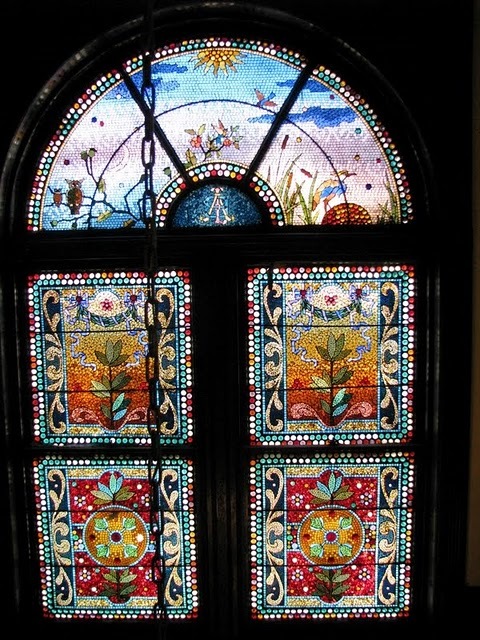 What caught my eye about it particularly were the stained glass windows it held. 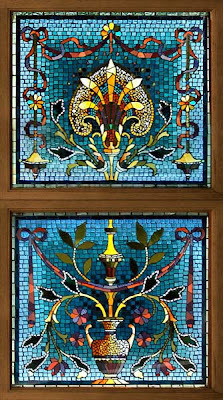 The Bailey House featured windows made by the Belcher Mosaic Glass company and these windows are some of the last surviving examples of the Belcher Company's work. 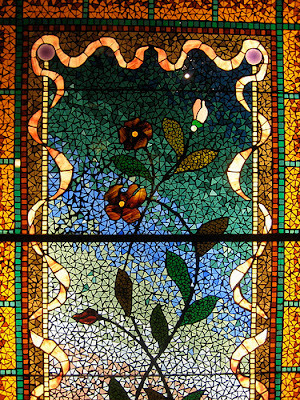 Belcher developed a new technique for making mosaic windows rather than the standard stained glass techniques used since the early middle ages. 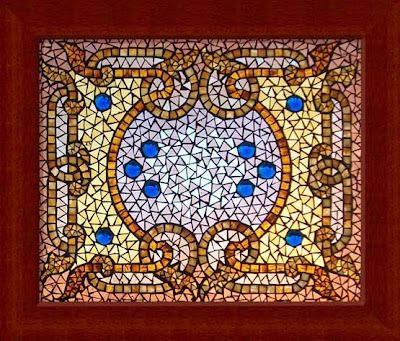 Rather than using lead cames between the individual pieces of glass, Belcher patented a process where he'd lay out the pattern of the window between two sheets of asbestos. 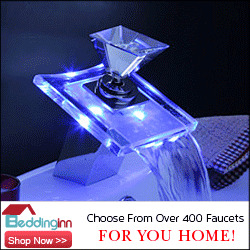 Then he poured a molten lead alloy over the whole works. 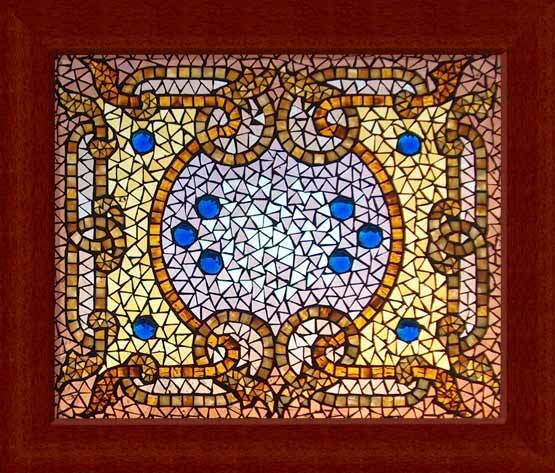 The molten alloy would flow between the pieces of glass and make a stable window. 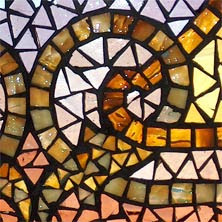 This process allowed Belcher to use much smaller pieces than most stained glass windows use and he could use pieces of glass that were in regular, repeating shapes --triangles usually but sometimes squares. The Belcher Mosaic Glass Company went out of business in 1880 and a handful of these windows survive. I think they're fascinating. Almost as fascinating as I find Tom's blog. Check it out and if you're ever in Manhattan and you need a tour guide, I know the best one out there. Great post! 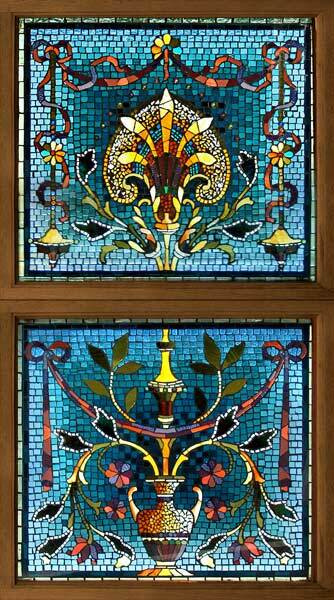 Art glass is a great way to add art to the kitchen too, either as a window or even a cabinet door insert. Thanks and I couldn't agree more. I wish somebody would revive this Belcher process. I'd never heard of it 'til recently and I am smitten with it. 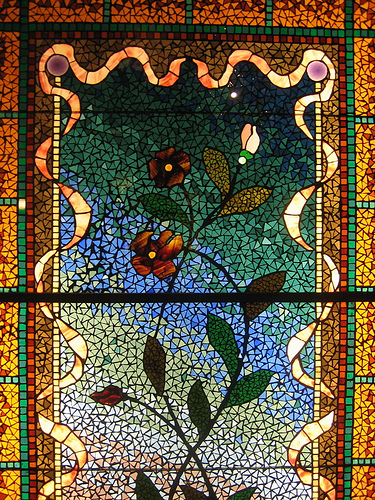 Anyone who would like to see more Belcher stained glass, can visit the 1890s house in cortland, NY.